Born today, next line in the Pitt dynasty, and a probable future MP. 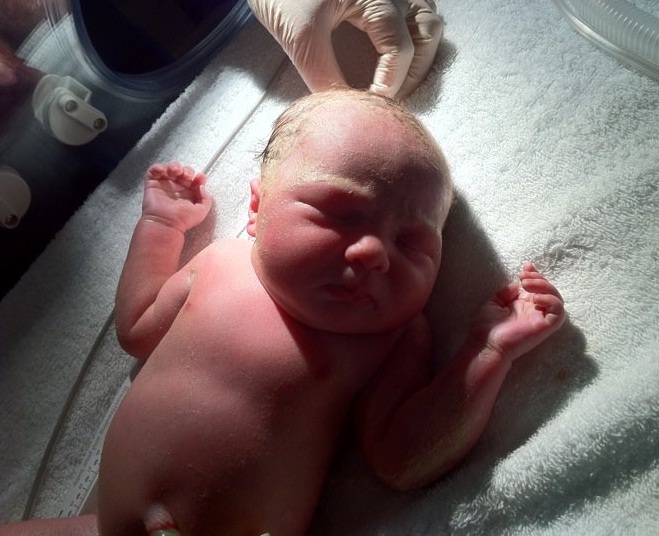 MP for Mulgrave, Curtis Pitt, snapped this photo on his mobile phone of his new baby in the last hour. "Say hi to our new baby girl, four weeks early, and 6lb 8oz (2.940kg) and 43.5cm," Curtis Pitt announced this afternoon, as he introduced his new daughter to the world via social media. "Kerry and I are still deciding on her name. Mother resting and Dad very happy. Tristan looking forward to meeting his little sister." Just after midday, Curtis posted this message to his 1400 Facebook readers: "Mad rush to be at the hospital with Kerry. Doctor's advice that our new bub comes today - four weeks early though." Premier Anna Bligh congratulated Curtis Pitt, who is also Minister for Disabilities, Mental Health and Aboriginal and Torres Strait Islander Partnerships. "Curtis tells me they are yet to decide on her name but mum and baby are doing well and dad is very proud," Anna Bligh said. "I hear big brother Tristan is pleased as punch with his new baby sister." All name suggestions for the new baby will be passed onto Cutris. All the best from the team at CairnsBlog.